You can take ONE cabin bag per person on board. That’s just enough space for a couple of nights away. There’s no weight limit but we do ask that you are able to lift it into the overhead locker. Cabin space is limited and there’s only room for up to 70 cabin bags so the overhead lockers fill up quickly. All remaining cabin bags will be put into the hold and can be collected from the baggage carousel on arrival in the terminal. We check bag sizes before you board. If they’re bigger than the maximum 56x45x25cm (including handles and wheels), they can’t go in the cabin and we’ll have to check them into the aircraft hold for a charge. See bags table for details on fees and charges dedicated page. If you’re unsure whether your cabin bag fits within our maximum dimensions you can use our handy bag sizing tool on the easyJet: Travel App. Simply open the app and click on your trip itinerary to find the bag sizing tool. You can then use your mobile phone camera to size your cabin bag. If it fits inside the maximum cabin bag dimensions you’re good to go! If it doesn’t fit, don’t worry! You can always add hold luggage quickly and easily through the app or within Manage Bookings. Maximum size 56x45x25cm, including handles and wheels. Cabin bags should be placed in the overhead lockers or if small enough under the seat in front of you. You can bring an additional under seat bag like a laptop bag or handbag. Maximum size 45x36x20cm. Bags must be placed under the seat in front of you. Take the hassle of out of carrying your cabin bag through the airport and avoid the rush for locker space by going Hands Free. Simply drop your cabin bag off at easyJet Plus Bag Drop and we’ll do the rest. You’ll even get your bags first off the baggage carousel. A small fee applies which can be found in our terms and conditions. Each customer including children and infants can buy up to three hold bags. A standard hold bag is 23kg (for new bookings made from 15 November 2017)*. You can buy extra weight in 3kgs units, up to a maximum of 32kg per bag. If you’re travelling with family or friends on the same flight and booking, you can pool your total weight allowance. No single item can weigh more than 32kg. Maximum total size (length + width + height) = under 275cm. The smart choice for a short break. If you're going away for a little longer our standard bag is the perfect choice. For those who pack everything except the kitchen sink. *If you made your booking before 15 November 2017 and bought a 20kg hold bag our new bag policy will not affect your booking and your bag allowance will remain 20kg. 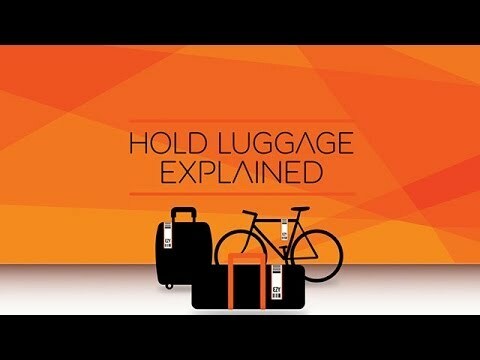 This video explains the easyJet hold luggage policy, including your allowances and any costs for exceeding them. Remember, although there is a charge for each hold item, it's always cheaper to book hold luggage online or via our customer service team before you arrive at the airport. You’re allowed to bring some extra things into the cabin. e.g. umbrella, overcoat, crutches, walking stick, one standard bag of goods bought at the airport. The easiest and cheapest way to do this is online or via our App when you book your flights. You can also add them after you’ve booked in Manage Bookings, or during online check-in. You can also do it at the airport, but it does cost a little more. See fees and charges. When you add hold luggage to your booking we add a bag to both your outbound and return journey. Once you’ve booked hold luggage we’re unable to offer you a refund should you change your mind. If you want to buy hold luggage for only one sector of your journey you’ll be unable to do that online. If you’ve already checked in you can still add hold luggage to your booking in Manage Bookings. Once you’ve added your luggage simply reprint your boarding passes. It’s important that you buy the right amount of weight before you fly. You can add extra weight to your hold luggage booking at any time before you fly. It’s easier and cheaper to do this online via Manage Bookings. If your hold luggage weighs more than your allowance when you arrive at the airport we charge you a fee for each 1kg of excess weight. (See fees and charges). Label your luggage with your name, destination address, email and phone number, and remove tags from previous flights. It’s also advisable to put a copy of your address inside your bag. Avoid packing valuables in your hold luggage and secure handles and loose straps to avoid any damage. It’s best to carry medicine, money and important travel documents in your cabin bag. Some items are not allowed in the cabin or hold luggage. See restricted items for guidance.